Two Atlanta convenience store owners pleaded guilty on Monday to illegally exchanging food stamps for millions of dollars. Two Atlanta convenience store owners have pleaded guilty to illegally exchanging food stamps for millions of dollars. The U.S. Attorney’s Office for the Northern District of Georgia said Samuel Kwushue is guilty of paying customers at his KD Metro Tropical Market convenience store in southwest Atlanta 60 cents on the dollar for their food stamps. The food stamps, also known as SNAP (Supplemental Nutrition Assistance Program) benefits, were then turned into the federal government for full reimbursement. Between 2010 and 2015, he made $2 million. 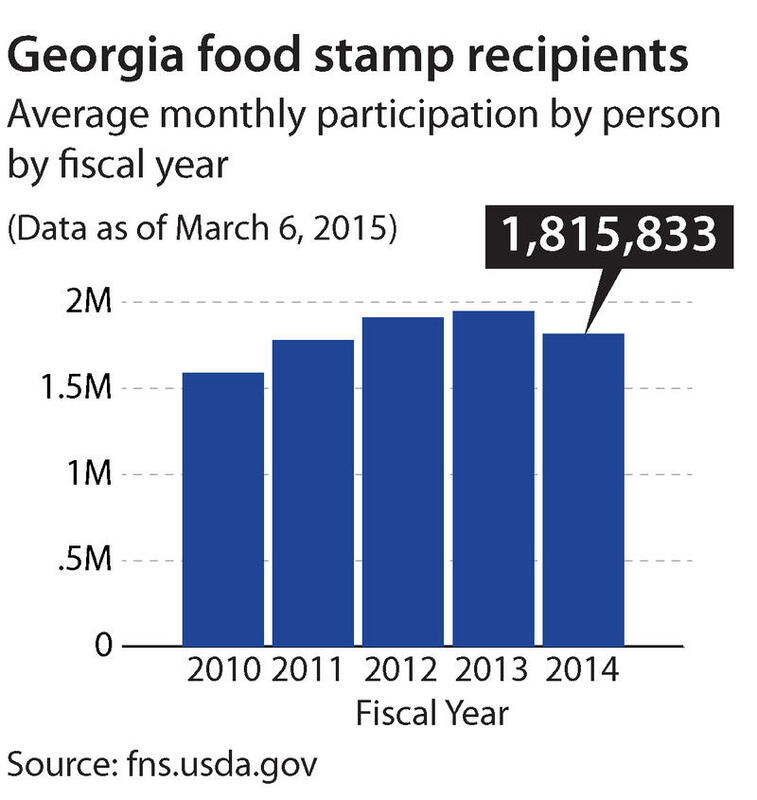 Georgia food stamp recipients by fiscal year. Sholondrell Taylor also pleaded guilty to food stamp fraud at her two stores in Forest Park and Atlanta. In addition to illegally exchanging food stamps at 50 cents on the dollar, she purchased Women, Infants, and Children (WIC) vouchers from benefit recipients at less than their actual value and redeemed them for full value with the U.S. Department of Agriculture. Between 2008 and 2011, she pocketed more than $1.6 million. Maurice Ingram is the unit manager for the Benefits Recovery Unit in the state’s Department of Human Services Office of Inspector General. Ingram said recipients might exchange their food stamp benefits for cash when they want to buy prohibited items like alcohol, tobacco and non-food items with EBT cards. Last year, an Atlanta couple pleaded guilty to running a statewide criminal ring that defrauded the government of $20 million. But Ingram said these fraud cases are not often: less than one percent of food stamps are used illegally in the state. Nationally, fraud cases are also on the decline. The U.S. Department of Agriculture said it oversees about 260,000 authorized SNAP retailers. Since the early 1990’s, with better technology, the department has seen a drop in stores illegally accepting cash for customers food stamps, from four percent to approximately 1.3 percent in 2008. The USDA says most fraud occurs at small retailers. Less than 0.5 percent of fraud cases are at larger grocery stores, where more than 82 percent of benefits are used. Angela Holland is president of the Georgia Association of Convenience Stores, which represents many small retailers. Holland said her group is always working to educate its members on what is legal for vendors who take food stamps and other government vouchers. SNAP state agencies are responsible for identifying and holding accountable recipients who break the rules. Ingram said, two years ago, a dedicated team of seven state investigators were assigned to monitor how, when and where food stamp recipients use their EBT cards. They were also tasked with conducting undercover operations to catch food stamp abuse using social media and visiting retailers where there was alleged abuse. In 2014, the USDA said states conducted more than 641,000 investigations. Last year, the USDA fined or temporarily disqualified 787 stores who were found to be violating program rules. It permanently disqualified 1,906 stores for illegally exchanging SNAP benefits for cash or falsifying an application. This is a more than 20 percent increase in the number of stores sanctioned compared to the 2014 fiscal year.